We’re all dancers! Dance is a universal activity; in all of its forms and styles, dancers express themselves, tell stories and share culture through movement. 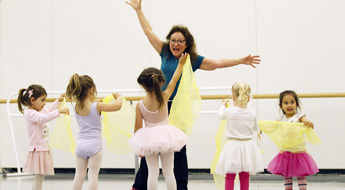 NBS Sharing Dance programs improve health and quality of life for people of all ages and abilities. Whether you are interested in taking a class or exploring our online resources to help provide or facilitate a class, get ready to experience the pure joy of dance! No previous dance experience required! Spark their imagination and watch them grow! Free resources for teachers and community leaders to get kids dancing in classroom and community settings. Dance is for everyone! Baycrest NBS Sharing Dance Seniors empowers seniors and older adults of all abilities to dance through safe and accessible dance programs that support them in their health and wellness goals. Dance can change lives! Sharing Dance Parkinson’s offers dance classes specifically designed for people with Parkinson’s Disease. Come dance with us, be part of an incredible community, and explore the many physical benefits of dance. REACH is your one stop for all Sharing Dance online resources. If you already have an account, click below. If you want to learn more about REACH and Sharing Dance programs, explore the pages in the navigation on the left.